WATERSIDE - A wonderful and rare opportunity to acquire a detached property situated on an enviable riverside plot in one of the most ideal North Kingston locations. The grand hallway leads to a reception/bedroom with en suite to one side and a fully fitted kitchen on the other. Towards the back of the property are two further reception rooms leading into a full width rear extension in turn opening on to the 134ft. private rear garden. 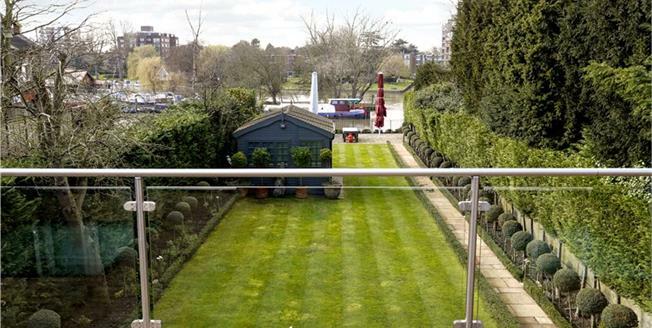 The beautifully mature lawned garden leads to a spectacular and unique view of the River Thames. Upstairs is the family bathroom and four bedrooms, one of which is en suite. The rear bedrooms have access to a sizeable west facing roof terrace again with beautiful views of the River Thames. The property also has plenty of off-street parking to the front and a separate studio room in the garden with clockroom. Albany Park Road is in the heart of North Kingston with excellent schools as well as easy access to Kingston town centre, the River Thames and Richmond Park. The nearest station is Kingston.